Congress is in recess for the Thanksgiving Holidays. I recall many a Thanksgiving when the troops were not on vacation but on the front line on Thanksgiving. In fact, this is still going on today. President Obama will ceremonially pardoned one or both turkeys on Wednesday in the White House Rose Garden. This ceremony has been going on for 65 years. President Obama what about pardoning the rest of us? It is indeed discouraging that as the United States races towards the fiscal cliff, Congress and the President and the members of his Executive Branch are more reflectively concerned about their celebration of Thanksgiving and the pardoning of turkeys. 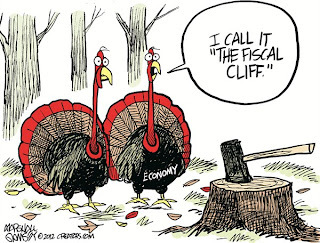 What about the fiscal cliff that Americans are facing? The U.S. Senate is expected to return on Nov. 26, and the U.S. House is expected to return on Nov. 27. The senate is expected to complete work on S. 3525, a bill concerning hunting and sportsmen and then turn to the Defense authorization bill, S. 3254. Tags: Washington, D.C., US Senate, US House, Congress, recess, White House, Barack Obama, Thanksgiving, pardoning turkeys, vacations, fiscal cliff To share or post to your site, click on "Post Link". Please mention / link to the ARRA News Service. Thanks!